Synthetic dreads are a great way to test the waters with an important decision. They are fairly easy to install and will give you a good idea of what the change will be like and how you might be able to adjust to it. There are many styles, shapes, textures, and even colors of synthetics dreads and doing a bit of research first will help determine the look and style you want to go for. Some prefer a more natural look to really emulate what a set of dreads would look like on your own head while others want a crazy color or style to mix things up. While synthetic dreads are a less permanent option than real dreads, they are still a big commitment. They cost money since they are like hair extensions and time to put them all in. There is some planning required based on your own hair type and length and finding something that will work for you. These are a bit tedious to install so taking the time to plan the process out is going to help you immensely. To install synthetic dreads, you will remove them out of the package. These dreads come in two different forms. First is one long piece while others are longer pieces that you actually bend in half. For the sake of simplicity, using the type that is longer but folds in half are a better choice than a simple long strand. These synthetic dreads are easier to install and actually make things seem thicker and fuller, just like a real head of dreads. To install these, you will section your own hair with some bands and clips and do very small pieces of hair at a time. 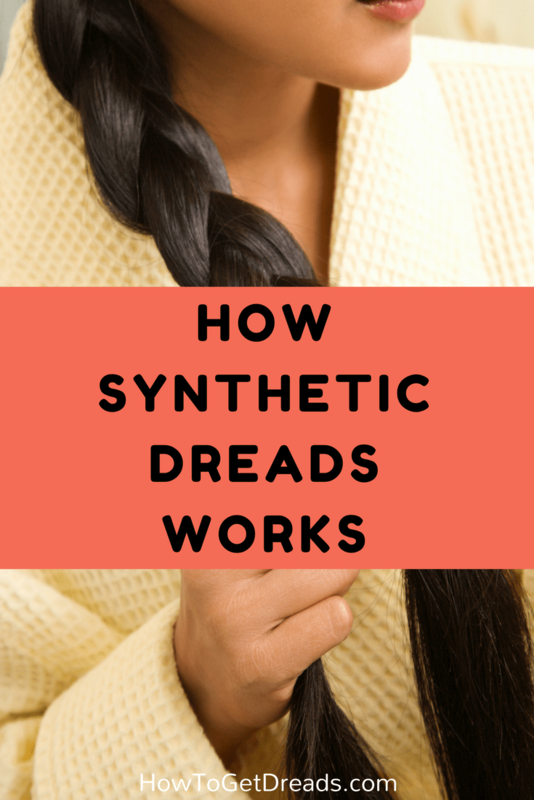 From there, once the dread is folded in half, you will take the center point of the long strand and take your own strand of hair and start twisting or braiding your hair along the outside of the synthetic dread. Now that the dreads are installed, which will be a long process you will be able to keep these dreads in for 4 to 6 weeks depending on how well they were installed and what the suggestion is for the type of synthetic dread you chose. They will get wet a lot like normal hair and, in fact, some synthetic dreads are made with real hair, but the chances that they loosen more and more with each wash are high. Since these are a temporary option, you should take this time to do all of your regular routine and activities and then some. Try new styles, do a tough workout, go hiking with them, and more. Try to experience what your whole life might be like. This really is the test of dreads before you make the commitment to go without synthetics. Getting dreads is such a cool thing, but it is a commitment. Going synthetic is just one of the many ways you can help prepare yourself mentally and physically for this change. It gives you time and experience to realize what you are going to be expecting on the dreaded journey.